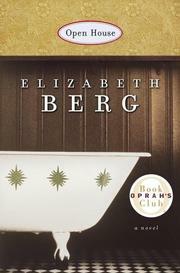 The eighth effortless novel from soft-pedaling specialist Berg (Until the Real Thing Comes Along, 1999, etc.) is an emotional slurpee/comedy featuring the newly separated mother of a near-teenaged son who finds the man of her dreams in spite of herself. What's a woman to do after her husband of 20 years packs a bag and walks out? Take a page from Martha Stewart's book, apparently, by getting dressed to the nines, making an elegant breakfast, and then trying to make the kid go along with the charade. Unfortunately for Samantha Morrow, she isn't Martha Stewart, and her son Travis is unflinchingly frank. So Sam goes to Tiffany's and writes a $12,000 check for silver flatware instead, whereupon her husband, David, takes all the money out of their joint account, and she has to start renting out rooms. The first boarder to move in is the mother of her grocery store's cashier, a sweet, capable lady who comes complete with a devoted boyfriend—and the hulk named King who moved her in is a sweetie, too. So what if the woman snores and keeps Travis awake? He and Sam adjust, and everything would be fine if she didn't keep hoping David would come back. But he has the good life and a girlfriend, while she's started temping (on King's recommendation) and dating (at her mother's insistence), the latter with disastrous results. The little old lady marries her boyfriend, another renter proves clinically depressed, and Sam has trouble adjusting to the working life. Even a distress call to Martha Stewart's 800 number doesn't help. Then, when she least expects it, love is in the air. Skillfully crafted, with a fluidity and snap that will delight Berg's fans but, when all is said and done, a distressingly familiar story.